A slow night, even by Friday standards. ABC: CHILD SUPPORT (0.7) and AGENTS OF SHIELD (0.6) were steady, but 20/20 dropped 0.2 to 0.6. NBC: BLINDSPOT lost 0.1 to 0.6, while TAKEN (0.5) and DATELINE (0.7) stayed as-is. 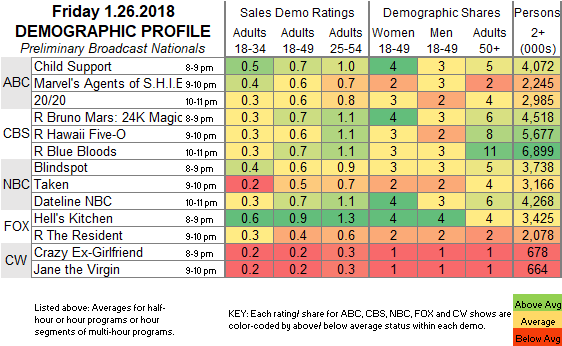 FOX: HELL’S KITCHEN won the night, for what it was worth, by holding at 0.9, and was followed by a rerun of THE RESIDENT at 0.4 (0.2 behind last week’s rerun of 9-1-1 in that slot). CW: JANE THE VIRGIN aired for the first time since December 8 and fell 0.1 to 0.2, matching the steady CRAZY EX-GIRLFRIEND. CBS: An all-rerun night, with the BRUNO MARS: 24K MAGIC special at 0.7, and procedurals at 0.6/0.7. Tonight’s SNL is hosted by Will Ferrell, with musical guest Chris Stapleton. On Sunday, CBS tries to remember that there are viewers younger than 50 years old with its telecast of the GRAMMY AWARDS.